On Wednesday I left the claustrophobic confines of midtown east for a pleasant stroll by Chelsea Piers. Photographers shot models on every street corner. The blocks were long and empty, and the sun was shining. I was on my way to the Obama Classic, a gathering of NBA stars supporting President Obama’s re-election. I was never much for autographs, especially after Bobby Bonilla tried to run me over in the Shea Stadium parking lot in 1992. Hardball is back, indeed. 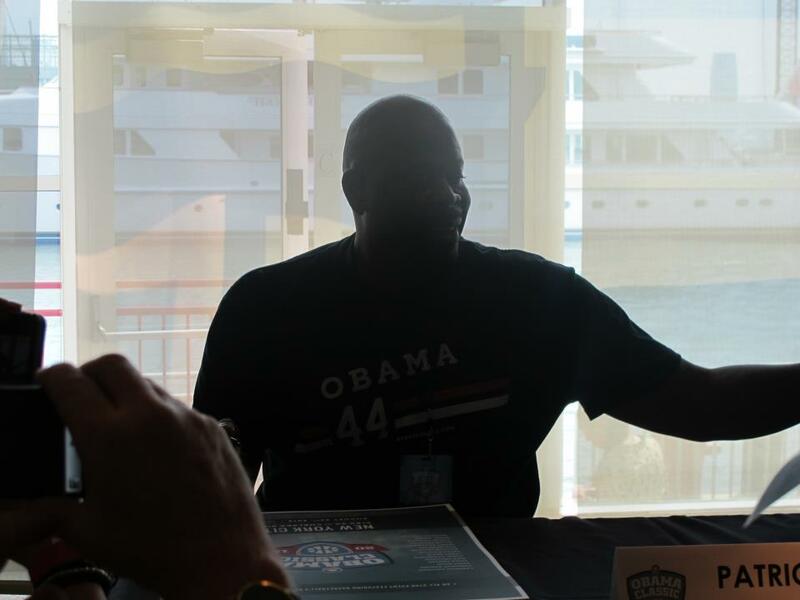 But tickets to dinner with Michael Jordan and Barack Obama ran at a cool $20,000 a head, so I opted for the $100 autograph session, choosing the session with Knicks legend Patrick Ewing. This was my first up close view of the 2012 Obama machine, and like most sequels, it is a passionless, money-grubbing reboot of the original Obamaville that was such a part of my life in 2008. The players were an hour late, even though they were coming from a gym across the parking lot. Instead of saying an inspiring word or two about why they were supporting Obama, they just mocked the crowd, which was obviously incapable of asking a question media-tested pros like Paul Pierce weren’t going to dodge. When Knicks Coach Mike Woodson was asked who was the toughest player to guard in the NBA, he snapped back, “Carmelo Anthony.” It was a charming open mic session. The only notable moment came when Patrick Ewing, asked whether the 1992 Dream Team would beat the 2012 Olympic team, emphatically replied, “Did you really ask that? Please. We’d kick their butts.” Patrick Ewing is a big dude who still looks ready to rumble. Then we all got autographed posters and were asked to leave. I’ll admit it felt a little weird getting an autograph from dudes ten years younger than me like Austin Rivers, the only player to sign with a gold marker. 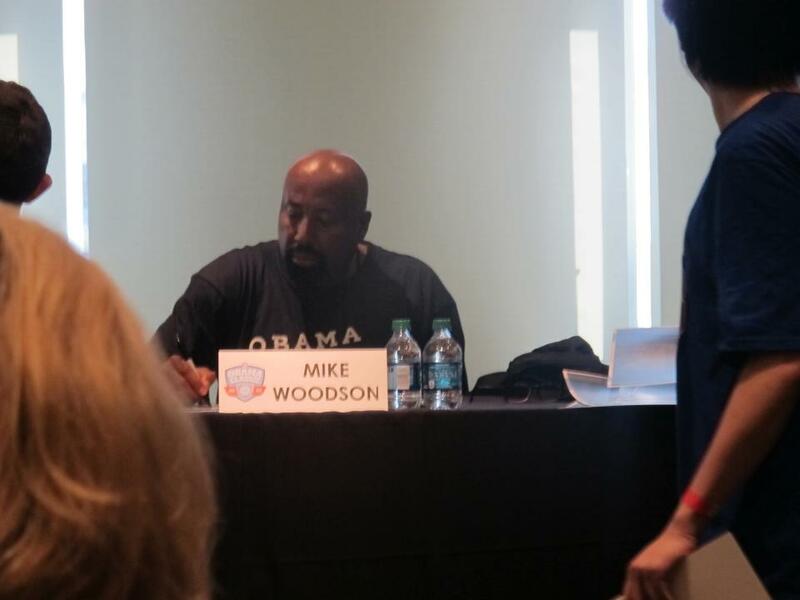 My longest conversation was with WNBA player Allison Feaster, who liked my Obama jersey. She’s played overseas quite a bit, and recommending living in Spain. So the event was a little clumsy. It was still a cooler donation than replying to one of Obama’s sad late night fundraising emails. And it warmed my heart to see NBA players stepping up. President Obama is obviously outgunned on the financial front, and these players can spare a dime. Many of them come from neighborhoods that need support, leadership and inspiration. Carmelo Anthony, a product of Baltimore, has been among the active players in the Obama fundraising operation. Michael Jordan’s public embracement of Obama (his dinner raised about $2.4 million) is an especially welcome change. In the 1990s, Jordan famously declined to support the African-American mayor of Charlotte, Harvey Gannt, in his Senate campaign against Jesse Helms, infamously uttering, “Republicans buy shoes, too.” I’m sure it helps that the President is a diehard Bulls fan, and clearly the best basketball player in the history of the presidency. This is still one of the most jaw-dropping moments I’ve ever seen from a political candidate on the campaign trail. Let’s see Mitt Romney try that. We can all agree that Ayn Rand’s ponderous tomes are more fun to throw of the roof of a 20-story building than they are to read. That’s why we chucked one into a Long Island City parking lot two nights ago during a roof party. Rand is getting even more right-wing adoration than usual these days, with the news that Paul Ryan is a big fan of her and P90X. But to her credit, it turns out that when her simplistic and hypocritical (she secretly received Medicare and Social Security benefits) worldview collided with the other Olympian figure in Republican lore, Ronald Reagan, she was not impressed. I urge you, as emphatically as I can, not to support the candidacy of Ronald Reagan. I urge you not to work for or advocate his nomination, and not to vote for him. My reasons are as follows: Mr. Reagan is not a champion of capitalism, but a conservative in the worst sense of that word—i.e., an advocate of a mixed economy with government controls slanted in favor of business rather than labor (which, philosophically, is as untenable a position as one could choose—see Fred Kinnan in Atlas Shrugged, pp. 541-2). This description applies in various degrees to most Republican politicians, but most of them preserve some respect for the rights of the individual. Mr. Reagan does not: he opposes the right to abortion. In conclusion, let me touch briefly on another question often asked me: What do I think of President Reagan? The best answer to give would be: But I don’t think of him—and the more I see, the less I think. I did not vote for him (or for anyone else) and events seem to justify me. The appalling disgrace of his administration is his connection with the so-called “Moral Majority” and sundry other TV religionists, who are struggling—apparently with his approval—to take us back to the Middle Ages, via the unconstitutional union of religion and politics. The threat to the future of capitalism is the fact that Reagan might fail so badly that he will become another ghost, like Herbert Hoover, to be invoked as an example of capitalism’s failure for another fifty years. Observe Reagan’s futile attempts to arouse the country by some sort of inspirational appeal. He is right in thinking that the country needs an inspirational element. But he will not find it in the God-Family-Tradition swamp. Amen, sister. Those words still ring true today. 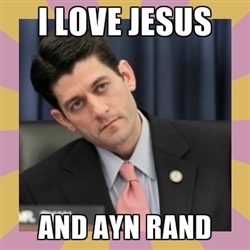 Someone needs to ask Paul Ryan to choose between Ayn Rand and Ronald Reagan. Ryan can’t call himself a Rand Objectivist if he endorses the Akin anti-abortion plan. Pose this choice to your local tea-partier and watch his head explode. It’s Friday, and you might be in the mood for a hilarious website to run out the clock this afternoon. May I recommend DontEvenReply.com? John Lindsay is a young dude with an axe to grind against the world of Craigslist. “Glorious Master Translator” is one of the great works of 2012. It’s now blocked at my work computer on grounds of “Tasteless”-ness, so good luck to all of you. 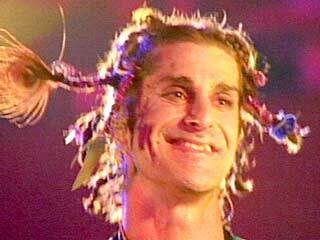 Speaking of glorious, why not end the week with a little Jane’s Addiction, live on SNL, back in the day. Have a great weekend! This entry was posted in Daily Nos and tagged Ayn Rand, Barack Obama, DontEvenReply, Jane's Addiction, Michael Jordan, Patrick Ewing, Ronald Reagan. Bookmark the permalink.